Tube bird feeders are a class of bird feeders that can actually cover a wide variety of bird feeders. There are true tube bird feeders with long clear tubes with ports that come set up to deliver different types of seed like sunflower or thistle. 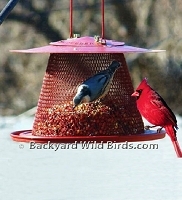 Feeders can even come that cater to specific birds like Cardinals. There are also wire mesh, wire screen or wire cage tube feeders. Some Feeders have triple tubes, over-hang roofs, wire perches or trays. Special feeders can have large capacity or be all metal. Feeders can be good at deterring squirrels, Grackles and Doves from taking over a feeder. All depending on what you want or don't want your bird feeder to do. We feature the Best in Class tube bird feeders whose materials are meant to last, with good designs for bird seed delivery and are easy to maintain. Large 20 inch tall Big Tube Bird Feeder with metal ports and big 4 inch diameter tube bird feeder. Has 6 special Cardinal seed ports staggered for easy viewing of your birds. Best in class bird feeders bird feeder is a multi seed tube bird feeder that has Quick Clean base with large capacity and 6 metal feeder bird seed ports. Great with sunflower seeds to attract most birds. 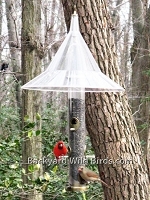 Cardinal Metal Bird Feeder with extended Roof is a wire mesh all metal bird feeder with small tray. The tray is what Cardinals like to perch on to feed. The roof has a nice overhang to protect the seed in the feeder and tray. The Cobalt Blue Bird Feeder has twin chambers to hold 2 types of bird seed. Blue feeders 2 wire mesh seed compartments allow for large seed like sunflower or safflower and small seed like thistle or sunflower chips. Copper Lantern Bird Feeder is a classy carriage lantern bird feeder. 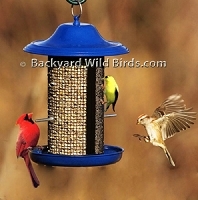 Perching birds like Cardinals will love this metal feeder with extended perches. Elegant design has a brushed copper metal finish. 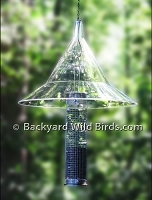 Brushed Copper Sunflower bird feeder attracts birds like Cardinals with style. Roof over hang helps keep this high capacity sunflower feeder seed out of the weather. Brushed Copper thistle tube bird feeder is just plain gorgeous. This high capacity wire mesh feeder is designed to pass thin thistle bird seed. Copper finished Triple Tube Bird feeder is a lagre capacity hanging bird feeder that can be filled with three different bird seeds. Easy to remove, threaded plastic weather guard top and tray simplifies filling. The Copper Turret Bird Feeder can add a refinement to your backyard. Medium capacity feeder holds 1.3 pounds of seed and puts it in a classy polished brushed copper design. Dual Seed Tube Bird Feeder can use either sunflower or thistle seeds, the two most popular seeds. In addition, its Even Feed internal baffles keeps seed at the ports of their upper levels for a longer period of time. This allows for constant seed delivery to many birds at the same time. Goldfinch Thistle Bird Feeder is yellow with wire mesh to hold thistle seed. Internal seed retainers keep seed in upper levels so more birds can use. The Goldfinch just love to cling to their thistle Feeder. Special Goldfinch Thistle Tube bird feeder is an 8 port finch feeder designed to hold and deliver thistle bird seed. 15 in. Tube finch Feeder is just right to attract the Goldfinch. Stainless steel Mesh Thistle Bird Feeder with 1.25 qt. capacity is a thistle seed metal feeder designed especially to attract the Goldfinch. A really fine finch feeder! This 15 in. 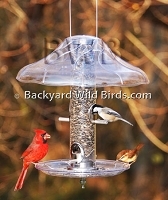 polycarbonate tube bird feeder has special Quick Clean base and UV protected clear tube feeder. Bird feeder metal top, bottom and 4 seed ports are antique brass. Metal Thistle Bird Feeder is a No No finch feeder with evenfeed internal baffles. All metal feeder is a mesh feeder just for thistle bird seed. Bird feeder makes a great Goldfinch feeder! The Snowman Solar Bird Feeder is a wire mesh sunflower bird feeder. This Mr. Snow man is designed with solar light to glow at night. Have some fun with your bird feeders. The Snow Woman Bird Feeder is a wire mesh sunflower bird feeder. The Mrs. Snowman is designed to be functional and decorative. A fun attractive feeder for all seasons. 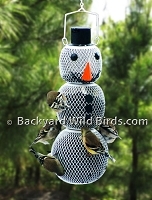 The Snowman Bird Feeder is a wire mesh sunflower bird feeder. The Mr. Snow man is designed to be functional and decorative. Have some fun with your bird feeders. 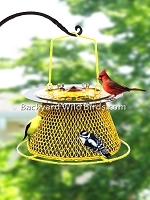 Goldfinch Bird Feeder that they love is this Big Yellow 17.5 in. Thistle bird feeder. Goldfinch bird feeder that really attracts them! Super Spiral large 18 inch Green Sunflower Bird Feeder holds about 3 qrts of and feeds a lot of birds at one time. Spiral Bird Feeder that the Goldfinches and Cardinals loves is this Big 17.5 in. copper color Spiral Sunflower bird feeder with tray. 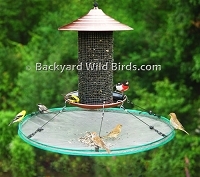 This Spiral Goldfinch bird feeder is a 36 in. Tall Thistle Tube bird feeder size that birds and birders can appreciate! More perch area means more birds, shown here with 15 Goldfinches. Finch Bird Feeder that the Goldfinch loves is this Big 17.5 in. copper color Spiral Thistle bird feeder. Goldfinch bird feeder that really attracts them! Steel Magnum Sunflower Bird Feeder feeds songbirds their favorite type of seed with plenty of room for all on its large capacity mesh feeder. 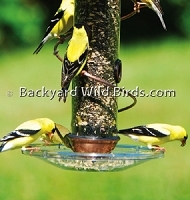 Steel Magnum Thistle Bird Feeder feeds Goldfinches their favorite type of seed in its large capacity bird feeder. Triple Tube Bird feeder is a lagre capacity 9 port hanging bird feeder that can be filled with three different bird seeds. Examples are sunflower seeds, mix seeds or shelled peanuts, etc. Upside down Goldfinch Feeder and 13 in clear Dome is a thistle bird feeder especially for the Goldfinch. Unique upside down feeder attracts Goldfinches and discourages red House Finches.